If you don't know the Trail Band, perhaps you remember Seafood Mama...or Quarterflash? 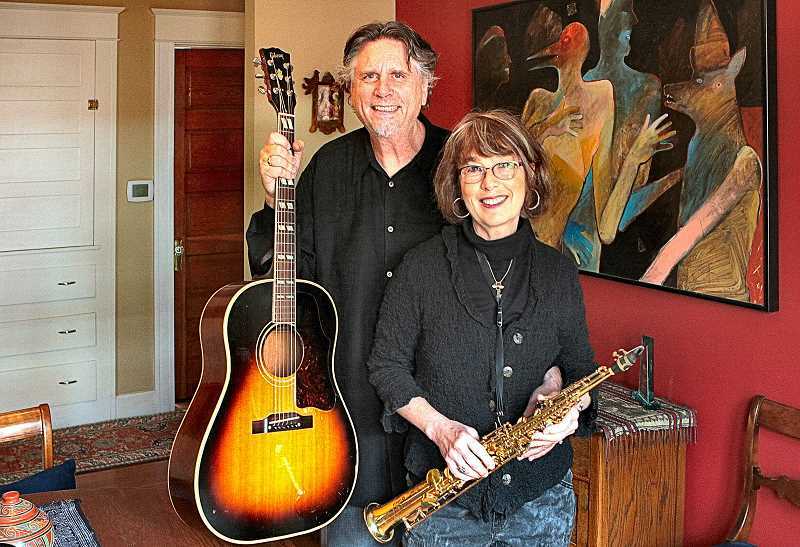 Two Sellwood musicians, Marv and Rindy Ross – whose rising local pop music band "Seafood Mama" led to a new incarnation as nationally famous "Quarterflash", with its major hits in the 1980s – later went on to start "The Trail Band". But, now, they have announced they are about to retire – not from music, but from their popular bands – winding down late this year and next spring. Unusual for professional musicians, the couple has been in only four bands during their career that's spanned five decades, remarked Marv, in an interview with THE BEE in their home's dining room. It started in the early 1970s at the Oregon College of Education (now called Western Oregon State University) where they met and performed as a duo, then started their first band, "Jones Road"; in Portland they organized a band called "Beggars Opera", which became "Seafood Mama", and which then was re-formed as "Quarterflash". "In 1991, we began working with the State of Oregon people, who asked us to put together a touring band that could re-create music of the Oregon Trail for Oregon's Sesquicentennial celebration," recalled Marv. After 10 years of being rock 'n roll stars, the couple decided they'd really enjoy forming a band to play mid-19th century popular music, and the eight-piece acoustical "Trail Band" was formed. "From 1991 through 1993, we toured the state extensively; and, I wrote music for the band as well," Marv recalled. "After our three-year tour, we created and produced an old-fashioned Christmas show, like one might see in the 1800s; and while the program has changed over the 25 years, we've been doing the Holiday presentation every year." In December, "The Trail Band" will play its last Christmas shows, Rindy announced. "25 years just seemed like a good time because, although the band is healthy and we still enjoy playing this music, we've decided it's time to let it go, as we move on with our professional and personal lives," she explained. In addition to presenting the band's annual Christmas show at Brooklyn's Aladdin Theater, the group has been touring the Pacific Northwest with the concert during the Holidays. "Because our company books, produces, and tours the Christmas show – as much as we enjoy making the music, and being with the band members, it's really tiring doing all of the work it takes to produce big shows like these," remarked Marv. "Being neighbors with Duncan Campbell who had just founded Friends of the Children, we decided the first year to partner up, and make the Christmas show a benefit for that nonprofit organization," Marv said. "Now, 100 shows later, and $1 million raised for the cause, it's phenomenal that this show has been popular for a quarter of a century! "By the time folks read this, our shows at the Aladdin Theater, December 14 through 16 might be sold out; but many people travel to see us at our other venues in Canby, Silverton, Forest Grove, and in Salem," Rindy told THE BEE. Perhaps adieu to Quarterflash, too? Their most well-known band, "Quarterflash", has had a good run, the Rosses reflected – starting in with their first hit release, "Harden My Heart", which in early 1982 hit #1 on the Billboard magazine "Hot Mainstream Rock Tracks" chart. "We've been talking about letting go of Quarterflash as well; maybe in the spring of 2019 we'll do our last show," Rindy mused aloud. Marv injected, "For me it's just 40 years of producing large shows …"
"It's interesting how Marv's music writing has transformed, and we see how music has changed for us over the years. That has us considering coming back to playing as a duo, or perhaps a trio," said Rindy. Marv responded, "Thinking back to when we were 18 years old, doing our first duet as an acoustical set, has us coming back to performing with just us two – that's something that we haven't done in a long long time, up until recently, and we've found that we're really enjoying it." Having lived in seclusion west of the Willamette River for some time, the Rosses moved to Sellwood about five years ago, where they enjoy walking over to Westmoreland Park and down into the Oaks Bottom Natural Area, and dining in local restaurants. "Now that we're older and we're not necessarily in the public eye so much, we enjoy the company of our neighbors; I even helped organize our Block Party this year," smiled Marv. "We love everything about Sellwood," nodded Rindy. In addition to rehearsing every day for their Christmas shows, Marv disclosed that he's written a collection of songs for Rindy, and another album of music – likely to be sung by Jon Koonce, of Portland band "Johnny & The Distractions" fame. "While we have a lot of projects going on, we're looking forward to making everything a bit 'smaller' these days," Marv said; Rindy added, "I'm looking forward to our music together, continuing for a long time!"